Last month we had our first international youth football camp in Vienna, Austria. We focused on the very basic techniques and broke the kids up by position. Each position group was put through three different progression drills. Here is a look into our technique football camp for the offensive line. The 3-point is something that needs to be taught right of the bat. 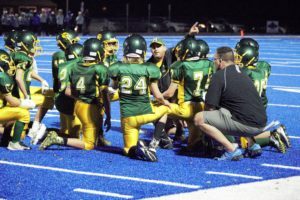 The offensive line will start every play in a 3-point stance, so it’s important that the kids are able to get into proper stances. A good stance will allow them to fire out and utilize strength and leverage. All the players line up across the field and the coaches instruct the proper 3-point stance. Once instructed, the kids get into the 3-point stance and the coaches check to make sure every player is in a proper stance. We will have them relax and then go through it another 2-3 times until all the players get into perfect stances. The feet should be about shoulder width. Feet should point straight ahead. This will allow for a faster fire-out. Once the feet are set, drop into a squatting position and extend the down hand slightly inside the near foot, in front of the body. The body weight should be around 70% on feet/hips and 30% on your hand. I always have my players put a lot of their weight on their feet and hips so they can maximize power on the get off. Back should be flat and head should be up. Put the players in 4 different lines. They will execute the power step on the whistle. We will do 3 power steps right, and then 3 power steps left. Then they go to the back of the line and the next players do the same thing. Steps are initiated on the whistle (ideally on a snap count). Short 6 inch step, strong step. “Power Step Right”, First step with right foot. “ Power Step Left”, First step with left foot. Sink Hips and Sky Eyes. Reset into stance. ( could go on whistle or snap count). Hands inside, elbows in, thumbs up, shot hands. 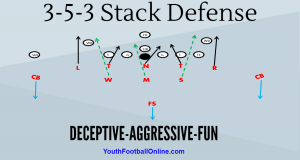 Players stay in their lines from drill # 2 and drive the coach with the blocking shield until the whistle blows. You can utilize blocking shields or a blocking sled. If you are limited as far as practice equipment goes, just have them drive a player that is put in front of them. Taking all the techniques learned in drill #s 1 & 2 and applying them to actual blocking. Good stance, fire-out, power steps, technique, and finish needs to be the focus. This is all about making sure the kids are implementing all the techniques that they were taught in drills 1 and 2. These progression drills are very simple to setup and are drills that should be done regularly with your team. You can adjust these drills to fit your offensive scheme. Regardless of scheme, these are offensive line techniques that need to be taught. Come back tomorrow to see the defensive line progression drills we implemented in our Austrian football camp!